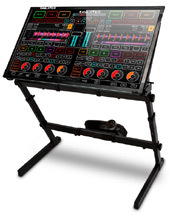 Mobile DJ Trade Tips - Issue 48 - Win Disco Gear! Win in Time for Christmas! Big drum roll....... it's the AMPdj Christmas Competition! We have some fabulous prizes to give away this month including a pair of speakers, a DJ program, music CDs, tripod covers and books. This is wholly due to the fantastic support from our friends in the industry; dB Technologies, Emulator (Smithson Martin), CD Pool, DJ Wrapz and Andrew Wylie. dB Technologies have been around a long time, providing a range of quality speakers for clubs, bands and DJs. 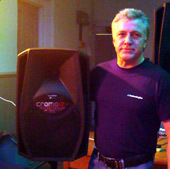 David Finlay from dB Technologies has offered a pair of their Cromo Club 12" speakers for one lucky winner. These lightweight active speakers are designed specifically for the mobile market. With their stylish appearance and well designed features, they are easy to carry and a doddle (even for a girly girl like me) to pop onto a speaker stand. When used on their side as monitors, they sit perfectly at a 45° angle. The active 12" cabs are fitted with a 400w integral amplifier and weigh in at only 18kg each. Other features include an XLR, jack and microphone input. These babies are advertised as 'entry' level systems. Yeah right! I was amazed at the clarity of sound, not too bright and shrill, but almost a 'wooden cab' mellow sound that could certainly pack a punch! In our opinion, the Cromo Clubs out perform their very reasonable price tag (rrp £499 a pair). The Canadian based company, Smithson Martin have developed an amazing product called 'Emulator'. It is a multi touch midi control program that operates on Windows 7 & 8 and Mac OS X.
Emulator can transform a DJ or lighting program into a multi touch system, negating the need for additional controllers or mixers. It works with all the major DJing programs such as Traktor, PCDJ, Virtual DJ, Serato and Ableton and lighting programs such as Light Jockey, Venue Magic, ShowXpress, Daslight and Martin Show Designer. If you DJ from Virtual DJ or similar, you will have experienced the problems with using a mouse, or even felt the necessity to buy a compatible controller for it. The Emulator works as an overlay for your existing program, enables you to customise the controls, allows you to touch more than one area at a time and ultimately gives you much more freedom and versatility. Your DJing can reach new heights! Hardware touch screen options are available (as illustrated above - not included in the prize), but it works on most everyday touch screen tablets or laptops. Smithson Martin have offered a box of the full version Emulator software to one very lucky winner. It runs on both OSX & Windows 7/8, and has a value of $299. On top of this, there are three t-shirts to give away as runner up prizes. This part of the competition is only available to current AMPdj members. For more information about Emulator and relating products please visit http://www.smithsonmartin.com . AMPdj members receive a 10% discount on all products; further details available in the members login area. CD Pool is a promo music service aimed primarily at DJs. Their services include both CD distribution and downloads. They cover a wide variety of genres and have various packages available to suit all types of DJs. The latest tracks from all the big labels are released before they reach the high street giving you a distinct advantage. Six lucky winners will each receive a 1 month free subscription to the Ultimate Mobile Disco Pack worth £29.99. The pack of three discs, radio, hits and dance hits, are delivered direct to your door each month and, in addition, weekly downloads are provided between deliveries to ensure you always have all the latest tracks for your functions. If you're looking for a cost effective and creative way to hide unsightly tripod stands or table legs, then DJ Wrapz have the answer. Table covers and wrapz covering the base of a tripod have proved very popular amongst DJs. Made from translucent white material, it is ideal for placing a light behind. 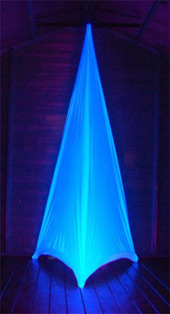 By using uplighters, cluster lasers and moonflowers, you can transform a stand into a feature. They are also available in black. New to the DJ Wrapz family are two full length wrapz; one to suit a lighting stand and the other for a speaker tripod. The robust elasticated material allows it to be stretched to fit most sizes and designs of stands. Each cover comes in a neat zip bag to keep it clean and tidy. The winner can select either a pair of double sided light stand covers or a pair of double sided speaker stand covers. AMPdj members are entitled to a 20% discount on all DJ Wrapz products; promo code available from member's login. Seasoned Mobile DJ, Andrew Wylie, has written two books crammed with a variety of games that you could use at a party. Both books are an invaluable resource for both DJs introducing games for the first time and DJs looking to expand on their repertoire. Andrew has very kindly supplied two sets of both books to be given away as prizes. For more information on purchasing copies, please contact Andy at straightshooterdisco@tiscali.co.uk or tel: 01592 774683. The contents of this Infomail are ©AMPdj 2012. It can be reproduced in whole or in part elsewhere provided a clear link to the original (i.e. this page) is included. Wed 5th December @ 4pm - 8pm - Gear4DJs are hosting a Christmas Showcase - a perfect opportunity to invest in new gear ahead of the busy Christmas period! Tues 8th January 2013 @ 8pm West of Scotland DJ meet-up at Burnhill Bar, Rutherglen, Glasgow, G73 1JE. Supported by RS Sound & Light, Lamba, AMPdj & Pro Mobile - all welcome. Pro Mobile Conference - Time To Get Serious, Crowne Plaza, Heythrop Park. A new and unique opportunity for DJs in the UK to learn, network and develop. Reduced delegate packages are available to those who book their places before the end of 2012. Spaces are limited and on a 'first come- first served' basis. Each year this show gets bigger and the attendee figures grow with it - in 2012 this three day event attracted over 8,000 visitors. We'll keep you updated next year but in the meantime make a note in your diary as it is earlier than previous years. 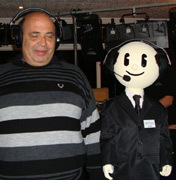 A surprising number of mobile DJs look a little (or a lot) like our superstar mascot. Do you resemble DJ Hank? Post a picture of yourself (with headphones) on Facebook and we'll let the viewers decide. You can also read what DJ Hank has been up to in his diary; published exclusively in Pro Mobile magazine and follow him on YouTube. November Pro Mobile now out.